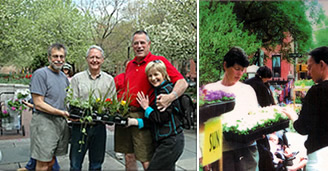 Each Spring, the Fund holds a plant sale at the Cobble Hill Park to raise money for tree plantings and tree care. Here, you will find annuals, herbs and perennials to brighten your garden or window boxes. Please join us, volunteers are most welcome! Each Winter, in early January, the Fund sponsors a Holiday Tree-chipping at Cobble Hill Park in conjunction with the Department of Parks and Recreation’s Mulchfest. Please see our Facebook Page for up to date Event information.